I have been quite literally fidgeting in my chair all day waiting for a moment to sit down and share this with you guys. When it comes to new product launches, I don't think I've ever been more excited about recommending a product. Let me start by saying this - I'm a tanning addict. It's not healthy and I get lectures from everyone I know about wearing more sunscreen or embracing the improvements of bottle tan over the years. Nine times out of ten I say, "thanks for the advice and head back into the sun to get brown as can be." However, reaching 35 and seeing the effects the sun has had on my skin have shown me that I'm a stubborn idiot that probably should have been more open to good advice. This leads me to where I sit now, product in hand, jaw on floor, and brown as can be legs laid out before me. I am a convert to a new tanning product that will in fact change the way we all get that summer glow this year. Last month, just before heading out to Los Angeles, I was given a bottle of St. Tropez in shower tanning lotion. As the sun's been out for a while in good old LA I knew I needed to arrive on the scene with a bit of colour or I'd be marked as a tourist in a red hot minute. So, I gave the bottle a go. St. Tropez in Shower Tanning Lotion had entered my life... and from there nothing remains the same. 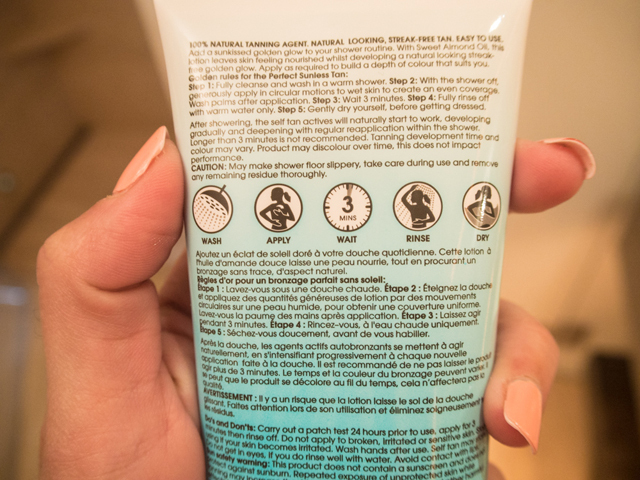 My first shower with the St. Tropez in Shower Tanning Lotion was relatively uneventful. Here's the deal - you take your shower and get all clean and what not, then you turn off the shower and distribute the St. Tropez product everywhere you want to be tan. You then wash your hands with the shower head, careful not to spray yourself, and stand in the shower for three minutes. Yes, three minutes. After 180 seconds you wash off the lotion, pat yourself dry with the towel and step out into the world as if nothing at all has happened. Over the course of the day you'll start to see your skin slightly change colour. This is a gradual tan, so you won't look like J.Lo the moment you step from the bathroom. That's another St. Tropez product you're looking for. After three days repeating this activity, I was a pro. The three minutes became an opportunity to do lunges in the shower (my bum thanks you St. Tropez) and the gradual tan gave me a brown glow like nothing I'd ever achieved from a beach. It was a healthy look, evenly spread and 100% natural in appearance. I now have three bottles stacked in the sink in my bathroom here in London to keep on hand for any tanning needs. When I say I love this product, I'm not lying. St. Tropez in Shower Tanning Lotion does not leave you smelling like a burnt cookie. Amen to that. There is nothing worse than being able to smell a woman who has been fake tanning it. It just doesn't work. So I'm pleased to announce that this product is nearly scent free once you leave the shower. It does have an odor on application, but it's actually quite pleasant. 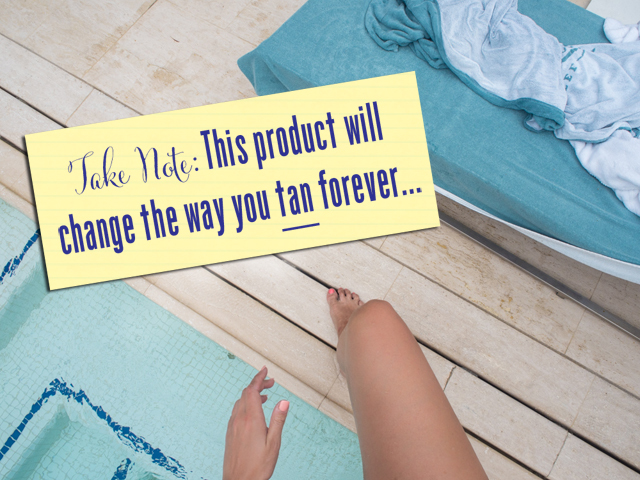 How many of us have put on tanning lotion only to have it end up staining our clothes, bed sheets or furniture? Embarrassingly this is one of the reasons I never really used too much fake tan. I once saw a woman step up from a white chair only to discover she had left her colour right there where her thighs had made contact with the fabric. Mortifying! St. Tropez in Shower Tanning Lotion is actually washed off in the shower. It doesn't even have a chance to stain your towels when you're drying off. This was a big plus for me. The less chance for embarrassing myself, the better. I've been pretty good about washing my hands after application, but last week I totally blanked on the step in the tanning process and paid for it. This stuff does work, so if you don't wash your hands you will end up with brown palms. It doesn't look natural and gives away the trick. Wash or regret! Just reminding you. This is just a reminder that the St. Tropez in Shower Tanning Lotion is slippery, just like any other lotion. If you apply and lotion falls on the shower floor, this can be dangerous. I know because I managed to do my first ever split as a result. Obviously my lunge activity is now done after I shower off the floor post application. You can never be too careful. But honestly, it's 180 seconds you can do anything with - sing, draft short stories in your mind or even scrub the tub if you're so inclined. Rumour has it that this stuff, after only having just launched, is set to sell out everywhere. Can't say I'm surprised. This is one product that will save the lives of many. No really, that is the actual truth. If this product can keep us out of the sun on our paths to becoming bronzed goddesses, it can save the lives of millions who might otherwise be exposed to harmful rays that can cause skin cancer. See where I'm going here? In short, if you aren't finding the way to your local St. Tropez sales location at this very moment, well, I've just given up all hope for you and the future! I kid, I kid. Seriously, give this product a go! In the USA you can buy St. Tropez in Shower Tanning Lotion at Sephora. In the UK, you can buy St. Tropez in Shower Tanning Lotion at Boots.